6th January 2017 | filed under Aesthetic Treatments, Non Surgical, Tattoo Removal. Tattoos are supposed to be a reflection of you as a person. Whether they express your thoughts and feelings, your personality, or your love for your family (or favourite football team), you tend to choose something that you want on your body forever. But what happens when this changes? If you’ve ever looked at a tattoo and thought “What on earth was I thinking?,” you’ll be relieved to know that you are not alone. Thousands of people admit to regretting their tattoo choices. For some, it’s a reminder of something they would rather forget, or something that no longer reflects the person they are now. For others, it’s a tattoo that was done by an amateur artist that serves as nothing but an embarrassing reminder of bad judgement. Whatever your reason for hating your tattoo, you’ll be happy to know that there is a solution! Tattoos are no longer referred to as “permanent,” as there are several technological advancements available to help rid you of the ink on your skin. (Tip: This doesn’t mean that you should rush into getting one). Here at The Aesthetic Skin Clinic, we offer tattoo removal with Q Switched Laser. What is Q Switched Laser? 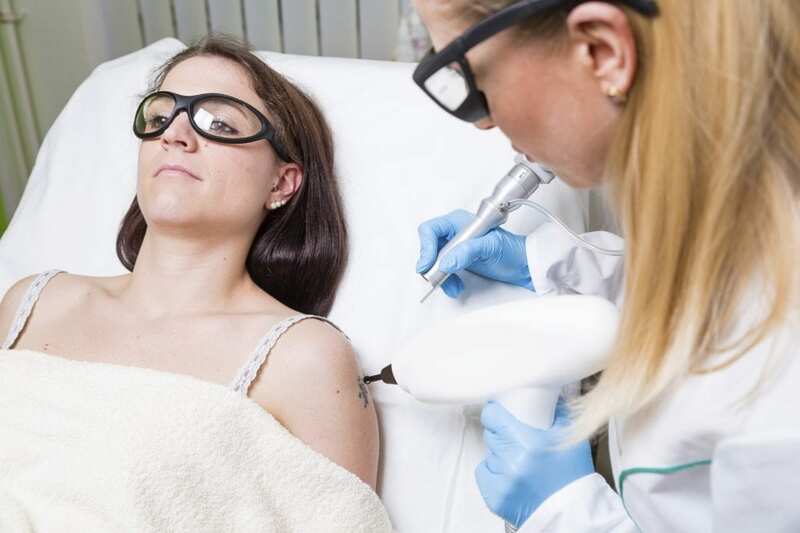 The thought of getting a tattoo removed can often seem very daunting, but with Q Switched Laser, you can be confident that you are choosing state of the art technology. It’s designed to remove tattoos through short pulses of energy that the skin absorbs. It targets the tattoo pigments by using both shock waves and extreme heat! During your initial consultation, you will be given an estimated time for your treatment. It depends on both the colour and size of your tattoo – black tattoos are the easiest to remove as they absorb all laser wavelengths. Realistically, you should expect up to 4 visits for a black tattoo, whilst more complex ones can take up to 10 sessions. Other considerations for tattoo removal success include the age and type of tattoo (was it done by a professional? ), as well as the colour of your own skin. You should expect the area to be red and itchy for the first few days. However, this is absolutely nothing to worry about – it simply means that the treatment is working correctly! With Q Switched Laser treatment, we require all patients to undergo a patch test before any treatment is carried out. This will allow us to ensure that the right settings are used on your skin to minimise the risk of any complications arising. If you would like to book your consultation, or simply learn more about our tattoo removal treatment, please do not hesitate to contact us today. We are a dedicated and professional clinic offering both surgical and non-surgical cosmetic treatments. Our number one aim is to ensure that all of our patients leave our practice feeling happier and more comfortable in their skin!